Anthony Bourdain in Orlando? Why not??? During our downtime at home, we love watching the Food Network, Cooking Channel and the Travel Channel. We have always thought that aside from a few shows that have come to Orlando, like Samantha Brown’s Passport to Weekends, the city needs more recognition when it comes to food and travel. Why hasn’t Adam from Man vs Food has come to the City Beautiful to do a challenge? 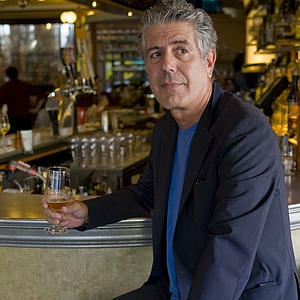 And why hasn’t the famous Anthony Bourdain come here to shoot No Reservations or his new show The Layover??? What doesn’t Orlando have to attract that kind of shows, chefs, exposure? Because we think it has plenty!! Orlando, aside from being home to our beloved Mickey Mouse, can be considered a foodie city. There are plenty of known as well as hidden restaurants in the City Beautiful that can definitely make it to Bourdain’s shows. He can go to Winter Park, Winter Garden, Dr. Phillips and downtown Orlando to explore and have delicious food. He can also follow the wonderful food trucks that are popping more than ever around the city. There’s actually a social media movement that has been created to try and bring Bourdain to Orlando. Campaign to bring Bourdain to Orlando is a Facebook fan page (can also be found in twitter) that ignited the ‘revolution’ to try and convince Bourdain that Orlando has a lot of food to offer. Those are only a few places that we would bring him. However, there are plenty more… hole in the wall restaurants that serve Brazilian pizza (with catupiry cheese) at International Drive; fish & chips and pint of beer; Peruvian cuisine; Vietnamese restaurants in Colonial Drive…. So many options!!! And Bourdain can not only eat in Orlando, he can drink his days away. He can hop from bar to bar in downtown Orlando (Church St. and Wall St.); try different beers at World of Beer and wine the night away at The Wine Company and all the wine places in the city (there are plenty!). So if you agree and think that Orlando is a foodie city and deserves more recognition, join the force and make Bourdain come to Orlando!! Fun Eats & Travels did! Tony will definitely see that the city is not full of tourists but made of people that love to eat, drink and love life!